The RT5047B is a highly integrated voltage regulator and interface IC, specifically design for supplying power and control signals from advanced satellite set-top box (STB) modules to the LNB down-converter in the antenna dish or to the multi-switch box. The device is consists of the independent current-mode boost controller and low dropout linear regulator along with the circuitry required for 22kHz tone shaping to support DiSEqCTM1.x communications. The RT5047B has protection (over-current, over-temperature and under-voltage lockout). 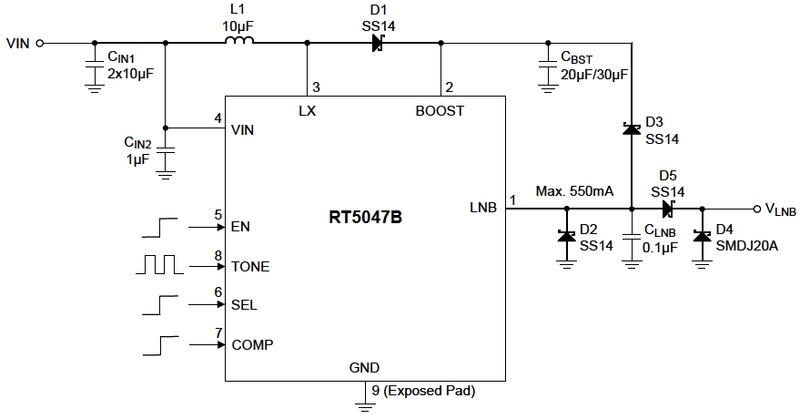 The RT5047B is available in a SOP-8 (Exposed Pad) package to achieve optimized solution for thermal dissipation.